Please refer to our stock # JC0065 when inquiring. This unusual and lovely brooch consists of two pins, each joined with an attached chain. 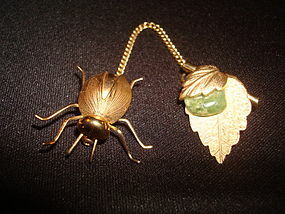 One pin features a gold toned beetle and the other a branch with two leaves holding a green semi-precious stone. With the chain extended, from the tip of the beetle to the tip of the main leaf it measures 4 1/2". The beetle itself measures 1" in length and the leaf measures 1 1/8". This brooch is in fine condition and is a real eye catcher!! !